Your browser cannot show this video. Your browser cannot show this video. Me conforme con Plateros Spanish School. Me gusta mucho que los maestros de aqui, me ensenaban muy sistematicamente espanol y Aprendi mucho otras cosas de Mexico como la cultura y la gastromonia mexicana. Le recomiendo aqui Plateros Spanish School. No pienso que te vayas a arrepentir a elegirla. I cannot say enough about my experience with Plateros Spanish School in Guanajuato, Mexico. My trip in January was my sixth language study trip and it was by far the best. I had very customized instruction on some of my biggest problem areas. I am pleased to say that my time there was well-spent. I now am able to comfortably do speak in the subjunctive which before my trip was only a lofty goal. The teachers were more than accommodating with everything- homestay arrangements-my host mom was a terrific gourmet chef, airport pickup and drop off-even though my flight got in late and departure left early they were there, entertainment (they arranged salsa lessons). I would highly recommend anyone considering a Spanish immersion trip to consider Plateros Spanish School. Plateros Spanish School is excellent, the instruction is superb, the facility quaint and attractive. My Spanish improved rapidly to fluency. I experienced a loving caring atmosphere in the beautiful home of my host family. The colorful houses and alleys, the little shops, the gardens and nightly Mariachi bands in the streets are captivating. 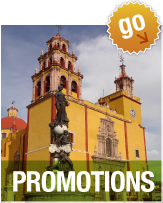 Guanajuato is absolutely SAFE, and the historical, religious, cultural, artistic, and geological sites are world famous. I couldn't see it all and want to return, for more sites, more colorful vistas and more Spanish instruction. Donna Samsa, North Carolina U.S.A.
Hej alle paa Plateros Spanish School. Jeg kan kun anbefale sprogkurser paa Plateros, du vil ikke fortryde det. I love this school!!! The teachers are fantastic, knowledgeable, caring, helpful and all around great! The location in El Centro makes staying in Guanajuato a total pleasure, And the one on one lessons, combined with the total program of grammar and studies of the Mexican culture, offers a great program for people learning Spanish. My Spanish began to improve on the first day of my two week stay. 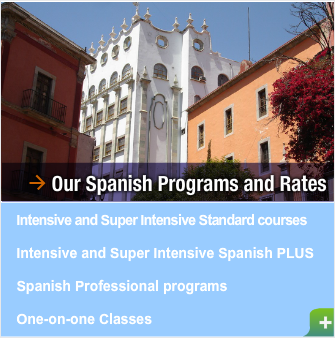 Go here to have a wonderful time and to learn Spanish from caring, fantastic teachers.